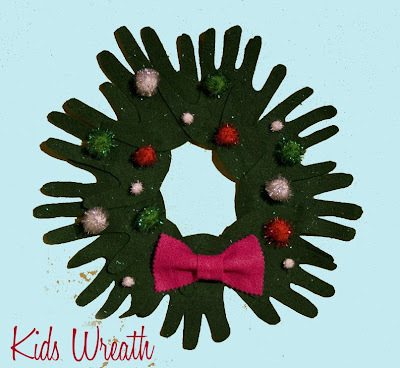 Kids will love to create this holiday wreath and it will look welcoming and beautiful on any door. This makes a great holiday gift for grandparents. 1 - Cut a 10 inch ring from a piece of heavy duty cardboard. 2 - Make a template of your kids hand with a scrap piece of paper. Using the template as a guide, cut hand shapes from the green felt. You will need about 10 hands. 3 - Using craft glue attach the hands around the ring, overlap as needed. Glue pom-poms as ornaments and add a bow cut from pink felt. 4 - Smile your finished! Hang on the door. You could also create a holiday tree by using a large triangle shape. Glue hands to be the tree branches and pom-poms for ornaments.